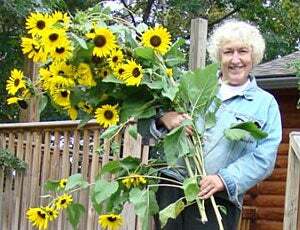 "Last year I decided to plant sunflowers on my property in North Western Wisconsin. There was plenty of pasture and the side of a long garage to plant a garden. I ordered various sunflower packets from American Meadows. I planted one package and waited. Nothing happened. So I started putting seeds everywhere. And, when I was tired, I started just dumping large groups of seeds in piles. I waited and still nothing happened. After a bit of time, I noticed some sprouts and felt like a proud parent. A few seed sprouts became a few more seed sprouts. Then the sprouting started in earnest. Piles of sunflower seeds turned into masses of intertwined roots and small green leaves. I carefully separated sprout after sprout and planted them in other parts of my property. As fast as I moved one plant, two or three sprouts would take its place. Along with the wild and uncontrolled population growth, I had to haul large green watering hoses around the yard. Dirty, wet, tired, and crying, I was determined not to let any sprouts die. Did I mention this was a drought year? I transplanted next to the air conditioner, along the garage, in front and side of the house, in my flower garden, near the fence, next to the sedum, near the sidewalk, under the windows, and in between the hostas. I even took plants to my local nursery to give to children. There were hundreds of sunflower plants scattered all over my property - and the majority of them lived. They were spectacular. 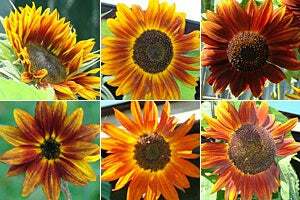 Enclosed are pictures of the sunflowers by color pallet—yellow, orange, red, and purple. 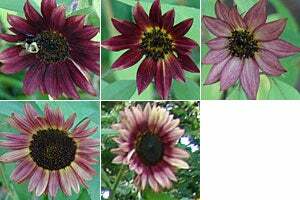 I never knew there were that many colors of sunflowers. And also I enclosed a picture of me holding a small portion of my sunflowers that had to be harvested after the winds bent them down. 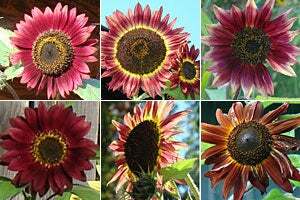 Would I plant sunflowers from American Meadows? Sure! But this year I will concentrate on one pound of (Silene armeria). 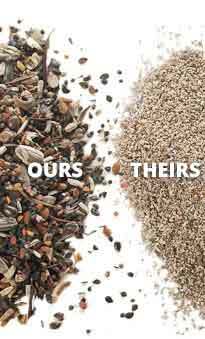 It looks like there are 4,480,132 seeds per pound. Guess I had better get out the water hoses!"